College Guidance with Proven Results. * Use the front door, not the side door! 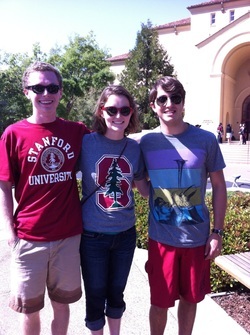 My Stanford ('17) kids: Gavin Nelson, Kate Nelson and Sam Kramer. More than a dozen years in the trenches of day-to-day college advising — alongside almost thirty years of SAT tutoring — has lent me perspective and a deep context for providing a unique and more uplifting kind of college counseling. So I spend dozens of hours interviewing student and family. These interviews are driven by the skill set I developed as a New York Times Notable biographer. Not only can I suss out the narrative strands that define a still-developing young identity, but I have a fine appreciation for the under-appreciated social-psychological needs of a family weathering the college decision-making storm. Indeed, the process of applying to colleges is daunting. From the outset, parents and students can be overwhelmed by the sheer expanse and impact of a process with so much potential to determine a young adult life. In such an overheated admissions environment, even the most grounded parents are uncertain about the balance between prestige, name brand and fit. The solution to effectively managing many preconceptions amidst a changing college landscape is a keen recognition of each student and his/her family’s needs. That recognition enhances the value of the critical relationships I’ve painstakingly maintained and nurtured with admissions professionals at top-tier schools over the past decade. These professionals have enlightened me on how subtle gradations and emphases play out in determining the microscopic difference between one overachieving high school student who is accepted and another who isn’t. The thrill of ideal college guidance is using this understanding to help students discover their young adult identities while maximizing their college opportunities.